The board runs out [6h][4s][2c][9c][Td] and Hill's jack plays to win the pot and eliminate Goodman in 6th place for $14,663. Andrews maintains his lead on a flop of [Tc][9s][4h] but Rosenkranz picks up an up and down straight draw. The [Qd] on the turn gives Rosenkranz the lead with a pair of kings. The [8c] falls on the river and, for just a moment, both players think that Andrews wins the pot. However, they both quickly realize that Rosenkranz makes a straight and Andrews is eliminated in 7th place for $12,432. The board runs out [Qc][Th][3d][Qh][9c] and Geanghan's trips are not good enough to beat Liberta's full house. Geanghan is eliminated in 8th place for $10,200. After coming into the final table with nearly 25% of the chips in play, Anton Smolyanskiy is the first player knocked out of at the final table of the $1,500 No-Limit Hold 'em event. He lost a series of all-in pots and finally was eliminated when his [As][6d] was unable to improve against the [Jc][Js] of Joe Liberta. We have reached the final table of nine in the $1,500 No-Limit Hold 'em event. If there is one person everyone in the poker community follows on Twitter, it is the legendary Kevin "Kevmath" Mathers. The man is literally an encyclopedia of poker knowledge. Kevmath is joining the Occupy Foxwoods movement for the next few days and is starting his trip by playing in the nightly $80 N0-Limit Hold 'em Turbo event. The final 19 players in the $1,500 No-Limit Hold 'em event have returned from dinner break and cards are back in the air. 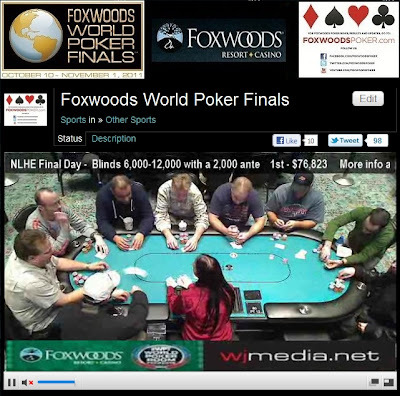 Watch the live feed of the feature table by clicking "Watch LIVE Video" at the top of the page. Both events currently running at the World Poker Finals are now on dinner break. There are 95 players remaining in the $1,000 Deep Stack event with 30 minutes remaining on dinner. The 19 remaining players in the $1,500 No-Limit Hold 'em event just left for their one-hour dinner break. The players on Day 2 of the $1,500 No-Limit Hold 'em event are down to the final two tables and all players are in the money. The blinds are currently 5,000-10,000 with a 1,500 ante. The average chip stack is now 298,000. At the end of this level, the players will be on a one-hour dinner break. We had a total of 203 players in the $1,000 NLHE Deep Stack event at the Foxwoods World Poker Finals. Early on Day 2 of the $1,500 No-Limit Hold 'em event, Ronnie Bardah has been eliminated from the tournament. $1,500 NLHE Day 2 Now Streaming Live! 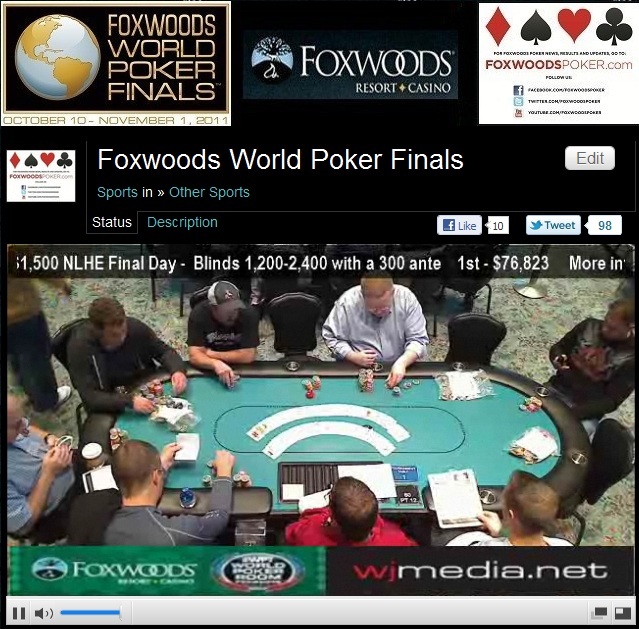 Day 2 of the $1,500 No-Limit Hold 'em event is now streaming live. $1,000 No-Limit Hold 'em Deep Stack Underway! The $1,000 No-Limit Hold 'em Deep Stack event is now underway at the Foxwoods World Poker Finals. Play has come to an end on Day 1 of the $1,500 No-Limit Hold 'em event. There are 55 players remaining and play will resume tomorrow at noon. End of Day 1 chip counts and Day 2 seating assignments will be posted right here on FoxwoodsPoker.com as soon as they are available.